Cytomegalovirus (CMV) retinitis is a serious disease causing compromised vision and ultimately a total loss of vision. CMV retinitis is typically associated with Acquired Immunodeficiency Syndrome (AIDS). In the early days of the AIDS epidemic, nearly one-quarter of all individuals diagnosed with late-stage AIDS also developed CMV retinitis. Thanks to aggressive treatments and a new, potent combination of drugs used to treat HIV/AIDS, CMV retinitis has been reduced by more than 80 percent. CMV retinitis is caused by the cytomegalovirus. Nearly 80 percent of all adults have antibodies for this very common virus, meaning they have been infected with the virus and their bodies have successfully fought it off. For individuals with compromised immune systems, especially due to HIV/AIDS, their bodies are unable to fight off the virus. All individuals with a weakened or suppressed immune system are at risk for CMV retinitis, including individuals who are undergoing chemotherapy or who have recently had a bone marrow transplant. Common symptoms of CMV retinitis include seeing “eye floaters” or small specks in the eye. As the disease progresses, individuals experience blurry vision, decreased peripheral vision, and light flashes. If the virus is not treated, CMV retinitis can cause a detached retina, leading to blindness in under six months. When stricken with CMV retinitis, the infection occurs in the most external part of your retina. The virus may be present for an extended period, but not active on this outer layer. Once the virus becomes activated, however, it will quickly trigger cell death and spread to deeper layers within the retina, ultimately leading to detachment and total vision loss. If you have been diagnosed with HIV/AIDS or have a weakened immune system and are experiencing vision changes, see an eye care professional immediately. Prompt care and treatment is absolutely essential to control the disease and prevent blindness. Anti-viral drugs are used to treat the progression of the disease, but these drugs cannot completely cure it. Anti-viral medication may be administered in pill form or as an implant in the eye. "This was my first visit to H. Rubin, I couldn't have left any happier. Dr. Dean and the entire staff made me feel extremely welcome at their office. I could not have asked for a more professional experience." 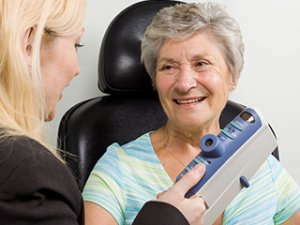 "Professional and personable staff and Dr Dean gives thorough eye exam. H Rubin offers great service." "I had the opportunity to have a visual exam with Dr Steve Dean. Dr Dean was thorough, professional and patient. Additionally, he assisted with the selection of an appropriate frame and lens. The staff was very friendly and assistive. My vision is essential to the performance of my profession. I highly recommend Dr Steve Dean's practice at H Rubin."